Is there anyone who’s never dreamed of learning a second language? Of course, not – the ability to communicate with people from other countries, understand their way of thinking and culture can be not only fascinating but also useful for both career and education. That’s why so many people are learning Chinese online. Searching for a fun way to learn the tones in Mandarin outside Chinese lessons? Perhaps this blog can help you with that! But, even the necessity of expanding knowledge of languages is now well known, the best way of doing that is still to be found. Thinking back on school days, learning foreign languages (similar with other subjects) was confined in a large classroom: teacher solos in front of the students who only repeat and do some exercises. However, when drilling rules and making exercise is possible in the classroom environment, practicing the language, by communicating and learning to create natural dialogues using it, is rather difficult. No matter how hard we try to create an engaging and effective experience for the language learners, the classroom will probably never be able to completely overcome its limitations. Lack of practice for individual students, limited time for practice, using only targeted vocabulary/grammar, frequent inclusions of mother tongue – those are obstacles for the students while learning the second language in the classroom. Traditional the classroom learning environment is usually described as 60-70% of “teacher talking time” or the lecture and only 40-30% of group tasks and communicating (usually with other students). So, for many students, the only opportunity to get teacher’s undivided attention comes during presenting of essays and papers or oral exams. According to the Natural Method Theory suggested by Stephen D. Krashen (University of Southern California), conversation is the base of language acquisition. In other words – more you speak the language, faster you improve it. Every tourist with basic knowledge of the country’s language is a great proof of this theory. While traveling, more you try to create a dialogue with the locals, more they will talk back to you (output), and while talked to you, of course, try to come up with an answer and make yourself understood (input). Based on a number of research that analyzes cons and pros of learning the language in large classrooms, this learning method has recognized to be quite ineffective when it comes to the language practice. Therefore, in past several years one-to-one foreign language training have become increasingly popular. According to the Natural Method Theory learners acquire language best through the modified input of the teacher. This means that the teacher modifies and adapts their language to student’s unique needs and maximizes both amount and type of their input to benefit the student. 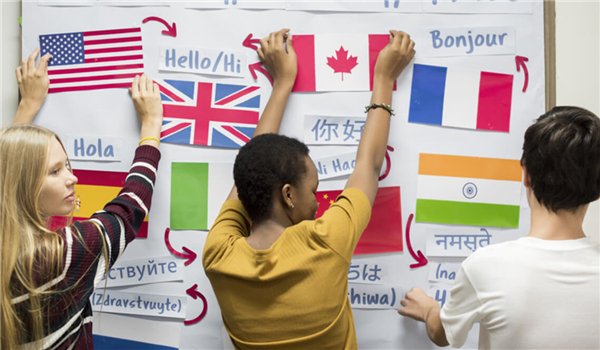 Even if learning the second language has become sort of necessity nowadays – frequent travels, career opportunities abroad, overseas education – finding the right teacher might be still a challenge. One-on-one language learning with a native speaker, and a skillful teacher on top of that, can be together difficult to find, expensive, and hard to fit in your schedule/other. But, thanks to the rapid development of online language training platforms, now the language learning can become as easy as it will ever be. Online language learning allows the student to learn the language at the convenient time and makes the access to the highly qualified native speaking teachers significantly easier. Only for the past year, according to The Guardian, interest to online one-on-one foreign languages learning increased up to 30% and continues growing within every day. Even if the classroom education still holds the leading position due to the school, college and university educating methods, for the extra curriculum, professional development, and intensive trainings more and more people choose online one-to-one classes. The crucial advantage of the online language learning is the opportunity to practice the language with the native speaking teacher with no other students waiting for their turn. According to the recent researches, more and more students (67%) require to having a native speaker as their language teacher due to the absence of the accent and clear pronunciation, full knowledge of the language and the culture, etc. While having this kind of educator can be quite challenging and difficult for the institutions offering large classroom classes, online platforms don’t face this problem. Due to the easy access for both – students and teachers – to the virtual classroom, native speaking teachers are more willing to engage in this kind of language courses. Overall benefits of learning languages online are getting more and more obvious as the online teaching methods progress and evolve. Positive students’ feedback of the learning materials, effectiveness, convenience and comfort, positive and engaging atmosphere are making the online education more and more popular. Price of the online courses can be distinctively lower that actual large classroom or live one-on-one classes: according to the observation of G. Stevenson, in 2016 prices for online programs were 30-35% lower than traditional learning methods. It’s explained by the fact that both teacher and student don’t need anything except for the computer and headset to get started. However, the virtual classroom doesn’t in any way close to the actual one – engaging and up-to-date materials, interactive classroom tools, a variety of activities and easy access to the classroom make online one-to-one classes very effective and engaging. Online language learning is a quite new instrument that is available for the students of all ages and needs all over the globe. Constantly improving and developing online educational platforms are slowly dislodging regular classrooms allowing individual students to find the best way to learn a foreign language.